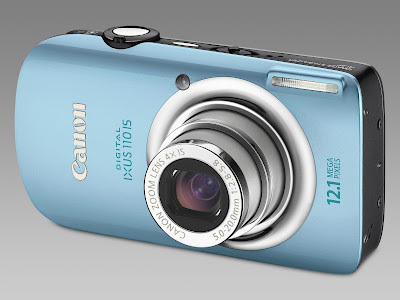 Canon Ixus has always been a very desirable line of ultra compact digital camera, retaining the same basic design introduced with their decade old APS-based Ixus camera. Unfortunately, UK often gets screwed when it comes to pricing - sometimes forced to pay nearly double what it costs across the Atlantic! Well here's a brilliant deal for those of you are looking for a new ultra compact digital camera. The Canon Ixus 110 IS is going for £189.99, down from its rip-off £349.99 list price just two months after its release, now bringing it more in line with US pricing. It contains a 12.1 Megapixel CCD sensor, wide angle lens (28mm equivalent), 4x optical zoom and all the usual technobabble stuff (image stabiliser, HDMI out etc.). Its slimmer cousin, the older Ixus 100 IS, is also selling for a mere £183.90, though you have to make do with only 3x optical zoom (33mm - 100mm equivalent). Unfortunately for a 2009 camera, neither are capable of shooting 720p HD videos. If that is something you are looking for, the pricier but equally compact Panasonic Lumix TZ7 will be perfect for you.